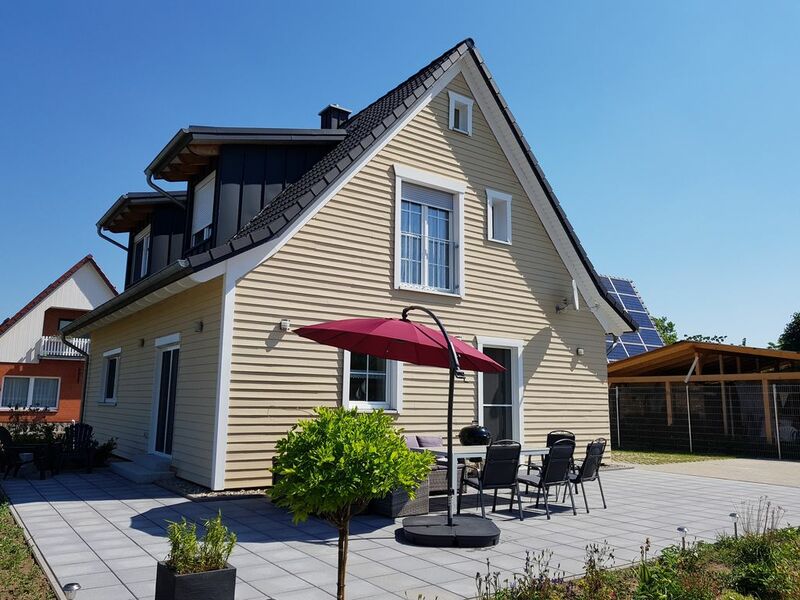 The modern furnished holiday home with three bedrooms, a fully equipped open kitchen and two bathrooms is located in direct proximity to the south bank of the Müritz. It can accommodate 6 people (plus two toddlers in a travel cot) and guarantees you a wonderful / relaxing holiday. You live comfortably on two levels with about 130 m² of living space. The upscale amenities, a beautiful garden, a large terrace provide comfort. Many other details and inclusive services make this holiday home a very special offer. WLAN, electric external blinds, fly screens belong to the self-evident equipment. The house is located in the center of Rechlin. The little Müritz is only about 300 m walk away. Directly on the water are also the marina, 2 restaurants, a playground and the pier. The cycle path network is very well developed and the entrance to the national park almost around the corner in Boek. In Rechlin there is a small shop with regional products (incl. Bicycle rental and post office - just opposite) and some shops with bakery, bank, pharmacy u. v.m ..
Sauber, gemütlich und sehr geräumig. Sehr schönes, geräumiges Haus für Familien mit Kindern. Hier lässt es sich so richtig gemütlich urlauben. Wir (6 Erwachsene, 3 Kleinkinder und 1 Baby) haben uns sehr wohl gefühlt und kommen gerne wieder. From the southeastern shore of the Müritz with the entrance to the Müritz National Park in Boek to the Brandenburg border at the Nebelsee extends the Southern Müritz region. Here are all those who want to relax in almost untouched nature. Here, on the southeast bank of the Müritz lies Rechlin, the center of the southern Müritz region. The place has a varied history "on its back", especially the 20th century coined the place as a military base. Rechlin was air force testing center, garrison and shipyard location. Today, Rechlin has devoted itself entirely to tourism, with the camping and caravan sites on the Bolter Canal and on the Boeker bank of the Müritz for camping and canoeists were always worth a special holiday tip. The harbor village of Müritz in Rechlin-Nord or the natural harbor on the Bolter Canal are ideal for water sports enthusiasts to Germany's most beautiful lake, the National Park Village Boek is gateway to the Müritz National Park. The east bank of the Müritz is Eldorado for campers, surfers and kiters, the Havelquellseen a paradise for water walkers with canoe or kayak. The Southern Müritz region also opens up to you about the cultural diversity of a year. Especially the Fusion Open Air Festival on the former military airfield in June attracts thousands of young people. The grounds become a huge camping park, the former aircraft hangars then become stages, dance and party floors. In the aviation technical museum Rechlin one learns much interesting to the Rechliner history of the aviation. In the house of the guest Rechlin you can find information material, hiking maps, fishing tables u. Purchase fishing licenses. Right across the street you will find a bicycle rental and a small shop selling regional and natural products. Those who want to escape the hustle and bustle of bus tourists on a day visit to the inner cities of the region, are in good hands in Rechlin. Here you go on vacation amidst a unique nature!